LCHF Smoked Salmon Scrambled Eggs - easy recipe. Is this the ultimate LCHF breakfast of champions? LCHF smoked salmon scrambled eggs with cream cheese and plenty of leafy greens. 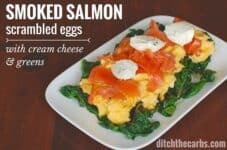 A great idea for a low carb breakfast is LCHF smoked salmon scrambled eggs with cream cheese and leafy greens. Eggs for me are my go-to breakfast. They are quick, easy and nutritious. Eggs are the most perfect food. Packed with proteins, choline, selenium, folate, zinc, iron, thiamine, lecithin, Vit D, iodine …. and almost zero carbs which is why we eat so many of them. My children (7, 10 and 13) all make their own scrambled eggs. They add cheese, salami, ham, last nights veggies, butter and whatever they like. Scrambled eggs are a superb way to use up any leftovers. This makes a huge meal, and is high in healthy fats so will keep you fuller for longer. Once you eat this, you may not even feel hungry for lunch. Remember to eat only when hungry, eat until almost full (it takes a while for your brain to catch up with what you have just eaten) and do not eat out of boredom or habit. If you don’t feel hungry at lunch, don’t eat. Learn to trust your hunger signals. This LCHF smoked salmon scrambled eggs with leafy greens is so more nutritious than a bowl of cereal/granola, which then makes you hungry by 10 am. I am always trying to find new ways to have eggs. By adding cream cheese and leafy greens to LCHF smoked salmon scrambled eggs, it turns this into a meal you can have at breakfast, lunch or dinner. TOP TIP :: 2 minute microwave scrambled eggs Simply whisk the eggs in a microwavable bowl, cook on HIGH for 1 minute, stir then cook again in HIGH for 45 seconds-1 minute depending on your microwave power. Stir. Done. This has to be the ultimate LCHF breakfast. Smoked salmon scrambled eggs and leafy greens. It surely ticks all the boxes? In a frying pan, heat half of the butter. Add the chopped leafy greens, salt and pepper and stir until they are wilted. Remove from the frying pan and place on the serving dish. In a little bowl, whisk the eggs and milk together with a fork. Melt the remaining butter in the hot frying pan, then pour the scrambled egg mixture on top. Stir gently to make fluffy scrambled eggs. 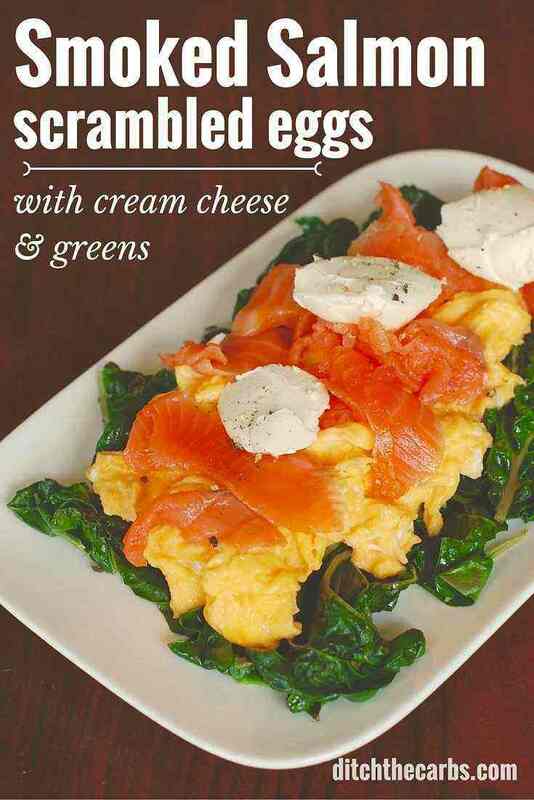 Place the warm scrambled eggs on top of the cooked leafy greens, add smoked salmon then garnish with the cream cheese. 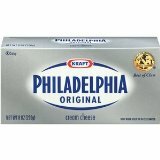 If you are new here this page will help you get started, and this page will show you what I keep in my pantry. This article and this article are good to read. Personally, I do not limit my egg intake at all. The World Heart Federation president, Salim Yusuf, has presented the data from the PURE study on diet and cardiovascular disease. DIET AND CARDIOVASCULAR DISEASE: CARBS ARE HARMFUL, FATS PROTECT US. I’m allergic to salmon. Can you suggest an option? Any other smoked fish you can tolerate would be amazing in these. 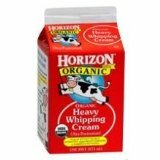 Could i use water instead of milk, i don’t buy milk, or maybe cream. Thank you. Sure, or you could even do without any liquid. I am still stuck in my old ways of diluting the eggs in some way to make them lighter, but it’s not really necessary. Hi Libby, Love The recipes, But I don’t Use microwaves, could you Cook Old Way, And Add Microwave Use between recipes, Just A thought. For sure, it is totally up to you how you choose to cook this, but by only providing recipes without a microwave option, shuts off a huge part of the population, who probably need help the most. 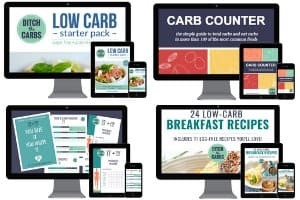 I like to help people find the easiest way possible to make real food, real easy. Microwaves don’t denature food or nutrients any more than an oven does but I can understand some hesitation for some. Just come across the site this morning. Liking what I see, the layout is good. For this recipe how much smoked salmon was used for the Fat calculation? Hi Andrew, I’m so glad you like Ditch The Carbs. For this recipe I used 25g of shaved smoked salmon.